Wood Grange Cottage is a newly refurbished, terraced cottage that was built in 1895. 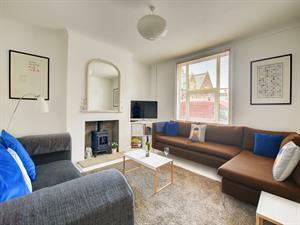 Deceptively spacious it accommodates up to 8 people and also has a pretty south facing garden. The master bedroom with an en-suite occupies the top floor and there are 3 further bedrooms and a family bathroom on the floor below. The living accommodation on the ground floor has a sitting room, dining room, kitchen and cloakroom. Cromer is a traditional seaside resort that offers plenty of activities including the family variety show at the Pavilion Theatre on the famous Pier. The Amazona Zoo , cycle hire, karting, an indoor play barn, golf, seafront entertainment, wide sandy beaches and coastal walks, make this such an ideal family holiday spot you may never want to go anywhere else! Wood Grange Cottage offers weekly bookings starting on Friday. Wood Grange Cot offers weekly bookings starting on Friday.